Inoue: Hello, I’m Inoue from Kanmo. Hello, Inoue-san. First, please tell us about the history of this store. Inoue: The founder was apparently an Osakan who came to Edo in 1656 as a fisherman. 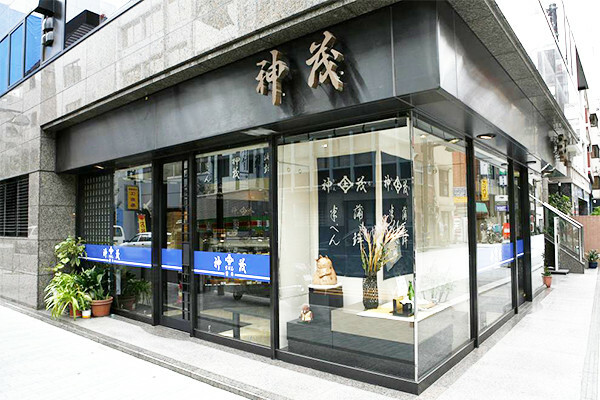 Eventually, we began processing fish into kamaboko, and established a store in Nihonbashi where Uogashi is. Inoue: Yes. Ｓhark fin has been popular as a delicacy in Chinese cuisine since those times, so they were exported from Japan to China. Because of that, there was a lot of shark circulating in the markets, but everything except the fins was destined to be thrown out. He decided to use the shark meat to make hanpen, and that has continued for over 330 years to the present. Wow! So there were sharks in the ocean near Edo at the time. What kind of shark is used in hanpen? Inoue: At our store, we use mako shark and blue shark. Mako shark is tasty, but they are expensive because not many are caught. 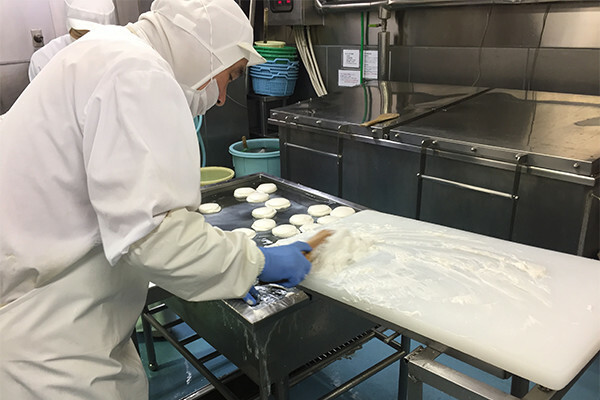 Because of that, there are a lot of stores that use codfish instead, but our store has always been particular about the ingredients and our methods. The ratio has always been 40 percent mako shark to 60 percent blue shark. Every day, fresh chilled shark arrives from Kesennuma, Yaizu and all the other fishing ports. The mako shark are young, fatty specimens weighing around 70 kilograms. That’s the foundation for the flavor of Kanmo’s hanpen. On the other hand, the meat of the blue shark is tender, so it holds air and fluffiness. We carefully prepare it by trimming away the dark meat, mince it and pass it through a sieve to remove the tough bits, add salt, yam and egg white, and then grind it on a stone mortar. Wow, shark meat is so white and beautiful! You use a stone mortar to grind the ingredients together, right? 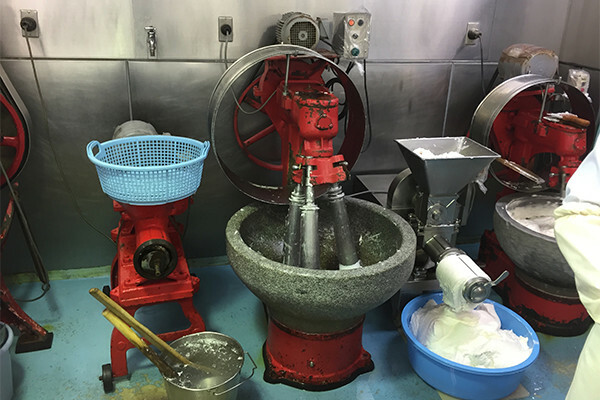 Inoue: We use a stone mortar because it heats up during the grinding process. Because it doesn’t destroy the cells in the shark meat, the flavor remains. This is some knowledge passed down through the generations. Grind it for around 45 minutes and pass it through a fine sieve, then put it into molds by hand and boil it. 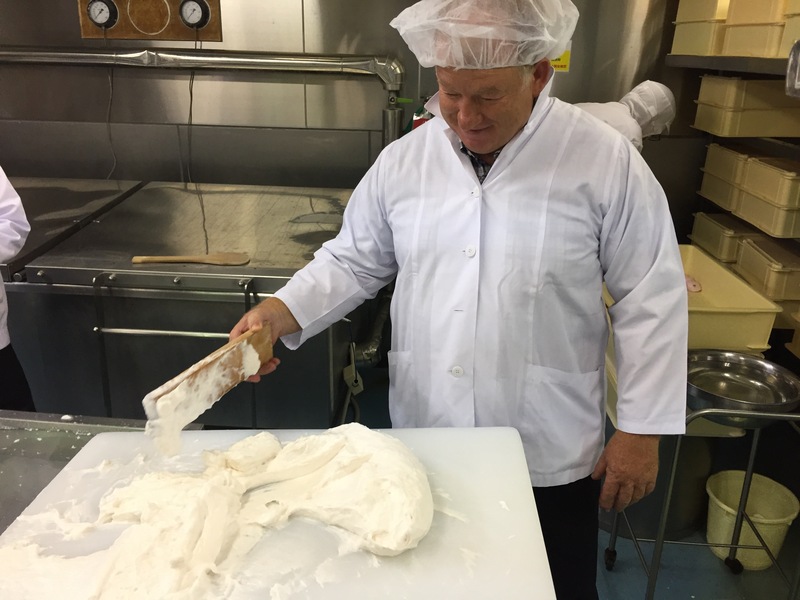 An employee is molding the paste now. They put it into the mold with a wooden spatula and hit it while swirling it around. This process fluffs it up. It’s so rhythmic and speedy! Would you like to try it, Thayne-san? Straining it twice carefully and forming it by hand to incorporate air and make it fluffy. Hanpen is an example of knowledge and techniques built up through a long history. Thank you for showing us the factory. It’s easy to see that it’s a clean place where nothing is wasted and things are made with skill. Inoue: Speaking of wasting nothing, the nikogori made from the mako shark skin left over when making hanpen is popular too. 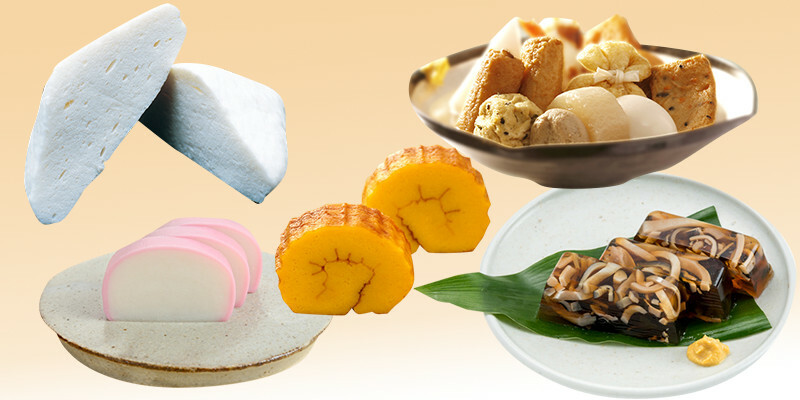 Kanmo makes a lot of products, starting with tedori hanpen, kamaboko, datemaki, and lots of fried foods that are often used in oden, but nikogori is an overlooked popular item. This store really seems to have the heritage of a visionary, doesn’t it? What was the previous master, and the one before him like? In a store like this with a history, there have been a lot of different masters, but traditions and skills have been passed down without a break. Inoue-san, what do you personally think now about inheriting this business? 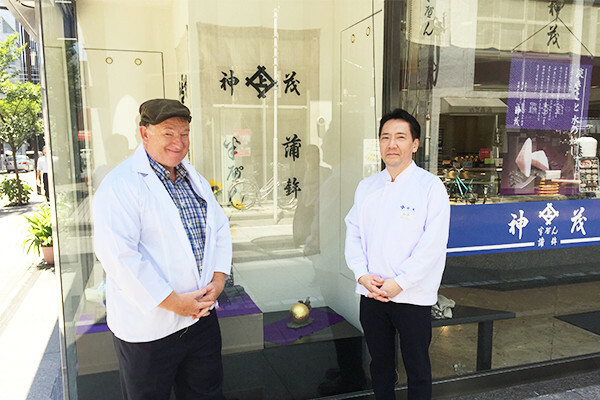 Inoue: It might sound simple, but I feel very happy about being able to sell things I’ve made. I came here after working in a major supermarket for a while after I graduated from college, and that was just as the Japanese economy took a downturn, so it was a difficult period for us. I worked hard to reduce expenses and review our products, and seeing that work reflected in the results simply makes me happy, and it makes me feel like my efforts paid off. At Kanmo, the words of a shop keeper from a previous generation have been passed down; Don’t make the business too big. The most important thing is making good products within our field of vision. I too will be happy if I can pass down traditional Japanese culture to the next generation. In other words, you’ve really found your vocation!